Today is my last day of opening presents from my swapper, Marie. The last parcel I opened was a pack of notelets that Marie had made herself. 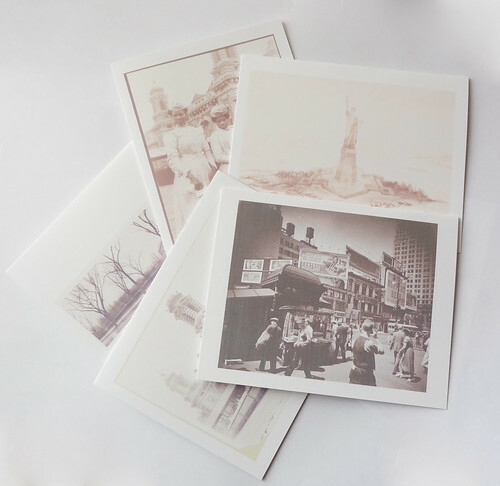 There were 12 cards with different images of New York in sepia. The images were taken from the New York Public Library's flickr set of public domain images. I had no idea that this resource existed. After just a quick look, I know I could lost for hours in their collections! This is a really thoughtful gift, another one of time that I know Marie must have spent looking for the right images. Marie said in her accompanying note with this gift that she could tell I enjoy writing from my blog. She's right, I do enjoy writing. The only problem is I don't enjoy posting! I am terrible at writing letters and then having to go out to the post box, especially in Winter. In recent years with the advent of the Internet, Facebook, Emails and texting I do most of my writing via a keyboard. The temptation for to email is made much greater by having done a secretarial course in my year out and learning to touch type. Typing paid my way through university and helped me into the job market after graduation. I type much much faster than I can hand write letters, so my letter writing has withered away. I tend to limit myself to cards on birthdays or when someone is sick or struggling. I don't post a letter just to say "hello". This last gift is one that has hopefully given me a kick up the backside to actually write to the people I care about, especially as so many of them are far away, up the motorway. Marie has done a couple of blog posts about her part in the swap, which I hope you read. They are interesting and shows the farmer's market where she got a lot of my gifts. This has been a wonderful experience and it has prompted me to try new things and look in different areas of the Internet. I've learnt more about about New York State and I have loved having presents to open every day. Thank you so much Marie, you have been an incredibly thoughtful and interesting swapper! I've enjoyed it so much. Now I shall have to live vicariously through Paula's delight as she opens her gifts from me! I will hopefully share a little about my selection process over the coming days as she opens more of the gifts.